Making announcements for employees can be tedious; you will need to make sure that every single employee gets informed, and if you’re going to do it verbally, then it would probably take a lot of time especially for big companies. So probably the best option for doing this is to make written announcements flyers or letters, you will simply need to place the document on bulletin boards or places that are very likely to be noticed. Through written announcements, you will be able to reach a large number of your staff in a lesser amount of time, which is far more convenient. If you agree with us on this, why not give it a try for your next staff announcements? If you haven’t done this before, then you may want to check out our samples and template on how to make staff announcements below. 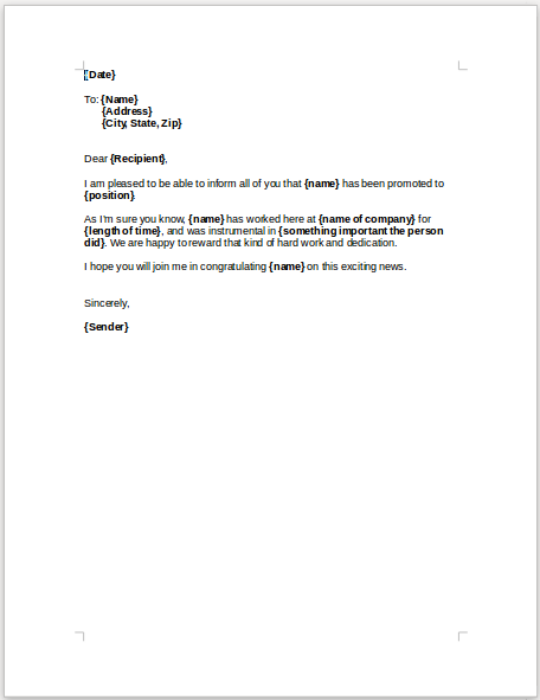 These staff announcement letter templates are meant for various purposes, which is why it would be quite unlikely for you not to find what you need here. If you’re planning on making staff announcements with regards to some changes in office policies, then we might just have the template for that purpose. 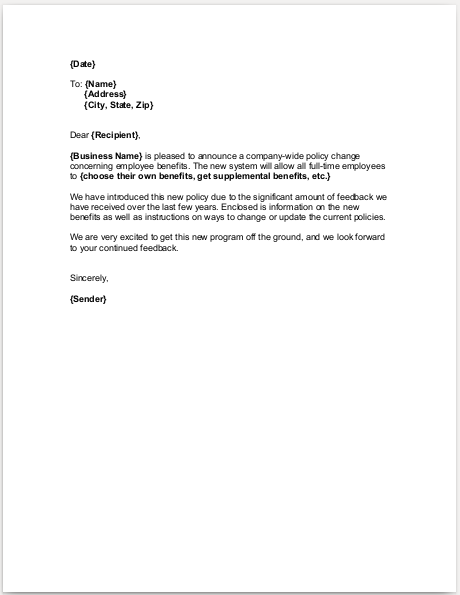 Check out the employee announcement sample above to see how it’s done, and you have the choice whether to download it or to use it merely for inspiration. 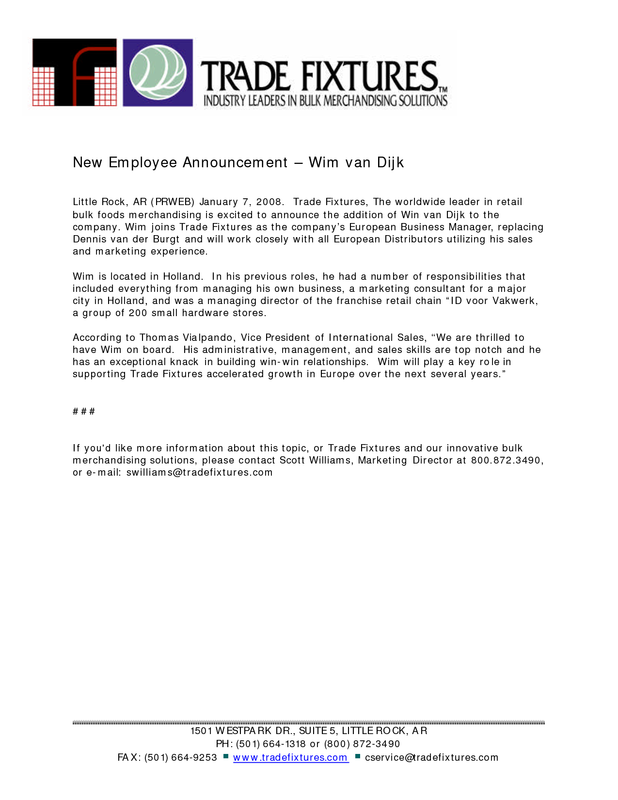 The addition of a new employee is something that is also worth announcing. For small companies, you can do this simply through verbal means. 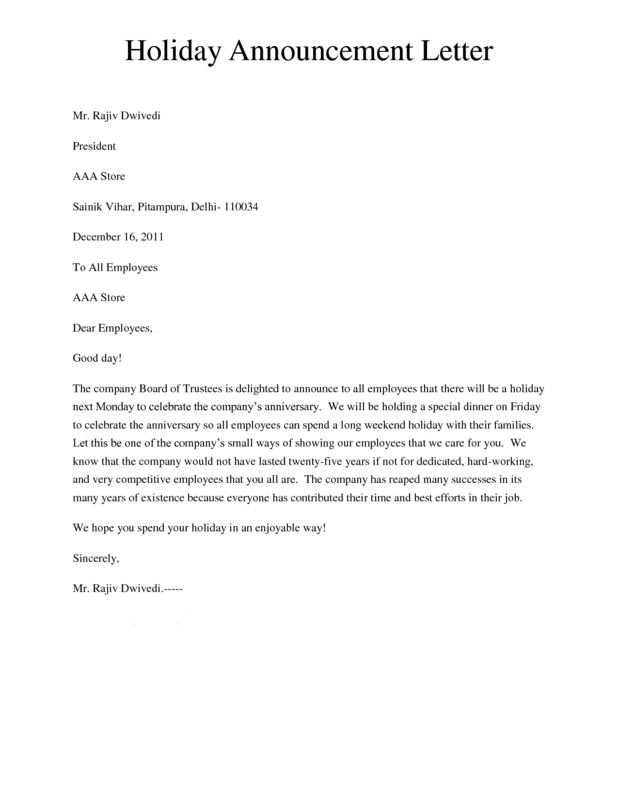 But for companies that have a large number of employees or are divided into various departments, then the best thing to do when making announcements is through written means which you can post bulletin boards. If this is the type of announcement you’re going the make, then feel free to use the template above. Once again, above is a template that you can use for making announcements for new employees, but unlike the previous one, this business announcement template is more simplistic and is far easier to customize. Of course, you can’t just make announcements about things that are irrelevant or are not even necessary. Well actually, you can, but it would only be a waste of your time and the time of your staff. When making announcements, make sure that the topics are something that your staff will really need to know and not just something that you want them to know. You may also see funeral announcement templates. Putting your announcements on random places that are not even accessible to your staff is such a waste of resources and effort. When making announcements that you want your staff to read while saving on these resources, make sure to put them in highly noticeable locations such as bulletin boards. You may also see meeting announcement templates. Well, at least the heading of the announcement should be clear even at a distance. This way, the staff will right away have an idea with regards to what the announcement is about, and this is also a good way for making something highly noticeable even for passersby. You may also see death announcement templates. If you’re making announcements for new staff, the termination of staff can also be announced but it is the company’s choice to do so since they can also do it privately. If you do plan on making an announcement, it is for letting the other employees know who has assumed the roles and responsibilities of the staff that was terminated. This way, if the employees are in need of something that was assigned previously to the terminated staff, they will know who to approach. You may also see birth announcement templates. Every company has their own sets of rules, standards, and policies which are explained to a newly hired staff just before they are exposed to the working environment. These policies should always be explained clearly because in cases wherein an employee commits something that they didn’t know was a violation, the employers will be held responsible. 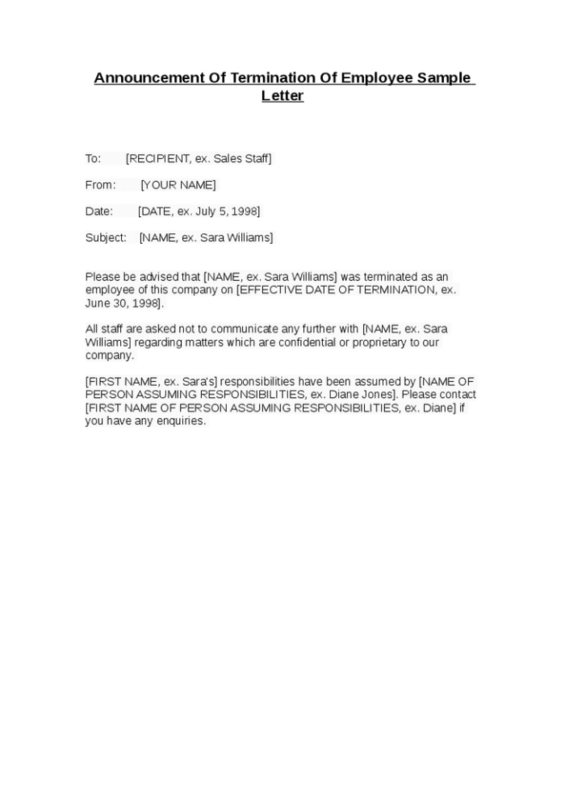 You may also see email announcement templates. But then again, it is also the employer’s responsibility to distribute handbooks to their staff which contains the company policies. This way, the staff will no longer have any excuse with regards to the rules and regulations. As they say, “ignorance of the law excuses no one”. To prevent themselves from committing violations, employees should always be mindful of their actions, ask co-workers if in doubt, or just read the handbook provided. Either monthly or yearly, a staff member will be bestowed with an award based on their performance in the company, which is something that these awardees would be proud of and will further motivate them to work hard. For related templates, you may want to check out our collection of a certificate of achievement templates that we have on this website. But if you have other reasons for making written staff announcement, you may still be able to use the template above as a reference. 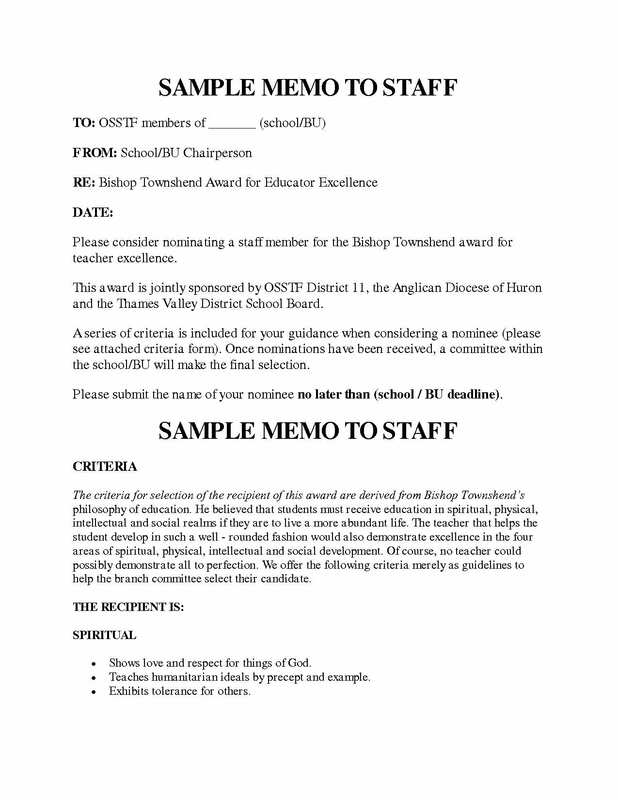 In relation to the previous template which deals with achievement awards for outstanding staff, here is a template for making a staff announcement for those who have been promoted. This is a good announcement to make for informing the rest of the employees that a certain staff member is now holding a much higher position. The promotion of employees may be due to multiple reasons, it may be performance-based, or it may also be based on their length of service in the company. But regardless of the reason, check out the staff promotion announcement template above and see if you can make good use of it. Staff promotions are a sign of recognition on the staff’s performance and allow them to improve on it for the benefit of the company and on themselves. Promotions allow the staff to grow as a member of the company and can make them realize that their efforts did not go to waste. You may also see baby announcement templates. Staff promotions are able to boost the staff’s motivation and will also increase their value in the company. In relation to the previous bullet point, their source of motivation mostly comes from the realization that their hard has finally paid off and did not go to waste. You may also see moving announcement card templates. The first and foremost factor that should be considered when promoting an employee is their performance. With this as the basis, employers can determine if this staff member is already fully capable of handling a higher position and more responsibilities. Another factor to consider is the staff’s length of service—or in other words, seniority. Just to be clear, we are not referring to seniority as in the person’s age, but their stay in the company. You may also see birth announcement cards. There is also another way for a staff to be promoted and it is through training seminars. If a staff has garnered enough training to make them eligible for promotion, they will then be allowed to apply for a higher position. You may also see birth announcement templates. Aside from regular days off wherein the staff is provided with days that they can take the time off from work, there are also holidays that also allow them to be free from all the stress. While this may only be appropriate for office staff, those in the medical field will still be required to work on holidays, though they may be compensated for their service with what is commonly referred to as “double pay”—a 100% bonus is given on top of their daily rate. You may also see pregnancy announcement designs. If there’s a holiday that’s fast approaching and you need to make an announcement to your employees, then feel free to use the template above. The holiday announcement template above is highly editable that you can use it regardless of the type of holiday.